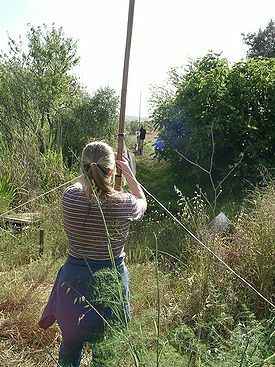 Stretching a mist net to capture wild birds (bird banding). Ornithology is the branch of zoology that deals with the study of birds. Ornithologists research and look at every facet of a bird's life. Some study how birds interact and live in their environment, while others look at how the the bird is structured, and how systems function. Birds were most likely a vital source of food for humans in early ages. Nearly 80 species remains have been uncovered in excavations from early towns and villages. Poultry and falconry (an art or sport which involves the use of trained raptors to hunt or pursue game for humans) were early hunting techniques used to catch birds a source of food. John Ray (1627-1705) and Francis Willughby (1635-1672) developed the first professional scale system of bird classification in the 17th century. The system used function and morphology, which are more scientifically sound methods, as opposed to behavior, in which information was gathered more from observations, making it less accurate. Ornithology's birth is considered to be a work by Francis Willughby called Ornithologia libri tres (1676), which was also worked on and completed by John Ray. One of the main reasons for ornithology's popularity spurt, was the realization that amateurs had chance to contribute to professional biology. These amateurs could essentially give scientists the data that was needed to help fix some central areas of concern in biology. An important and popular new tool became available for ornithology. Field guides were a major advancement. They allowed for easy and quick identification of species and contained other helpful information. The first versions of new generation of field guides were put together by Florence Merriam. Yet another result of the growth of ornithology was the establishment of organizations. Two notable organization are the Audubon Society in the US, and the Royal Society for the Protection of Birds (RSPB), which is located in Britain. The RSPB was founded by women and did not permit men to be members. This was an act of revenge on a policy of the British Ornithologists' Union to disclude women. The organization now allows men as members. As these organizations grew in size and number, many projects were undertaken. Atlases which show in great detail the distribution of different bird species across the country, and "Breeding Bird Surveys" provide information on breeding density of birds and the variations in density through time. There a number of organizations and volunteer projects that can be found all over the world. Birds are often times seen as pests. Bird strikes are one example of birds as pests. Bird strikes occur when a bird strikes a plane, sometimes getting caught in an engine or propeller. It is estimated that bird strikes cost US aviation $600,000,000 annually and have caused 195 deaths since 1988. Humans have played a huge role in the extinction of animals, and birds are no exception. There are many bird conservation societies found all over the world. Birds are also often kept as pets. The Feather Atlas U.S. Fish and Wildlife Service Forensics Lab. High-resolution scans of flight feathers of major groups of North American birds as an aid to species identification. This page was last modified on 3 August 2014, at 12:09.